I have been dialed into my new nutrition program for a week and a half now. Funny thing happens when you fuel right. YOU FEEL GREAT!!!! If you have followed me long enough, you know that I have not always felt this way. I battled depression, anxiety, a sleep disorder, and cancer. Took a whole hell a lot of learning to GROW through those things. I am thankful for them. They taught me a LOT and also helped me learn better how to help others through those things. Your GUT is your 2nd brain. What you fuel it with is what you get back. If you tell me you have migraines...I will tell you to fix your diet. If you tell me you are tired all the time.... I will tell you to fix your diet. If you tell me you have anxiety... I will tell you to fix your diet. If you tell me you struggle with depression... I will tell you to fix your diet. I don't just tell you. I SHOW you. I do it WITH you. So WHY are you still trying to do it alone? I am NOT the girl you go to for a quick fix that will not stick. I am NOT the girl you go to if you want to just talk about your problems without taking action towards a solution. When it comes down to it, you and that food (that really isnt food) is the reason you feel that way. So I teach people the tools they need to GET OUT OF THEIR WAY and truly see success and LIFETIME results. You are meant to feel GOOD. Period. So let's start feeling good! Message me today and let's get started!!! I am stoked to share with you a quick healthy snack that is packed with protein and healthy carbs (Yes keto people... your brain needs carbs, I only support BALANCED diets). On my nutrition plan this is one yellow and 1/2 spoon. Not on my nutrition program yet? Hit me up and let me tell ya about it. This recipe is from page 155 of the book you get with the program. 2. Drain, rinse, and dry chickpeas completely. 3. Combine chickpeas, oil, and salt in a medium bowl; toss gently to blend. 4. Spread chickpeas evenly on prepared pan. Bake for 60 minutes, rotating pan halfway through. 5. Sprinkle with chili powder; toss gently to blend. Allow to completely cool. 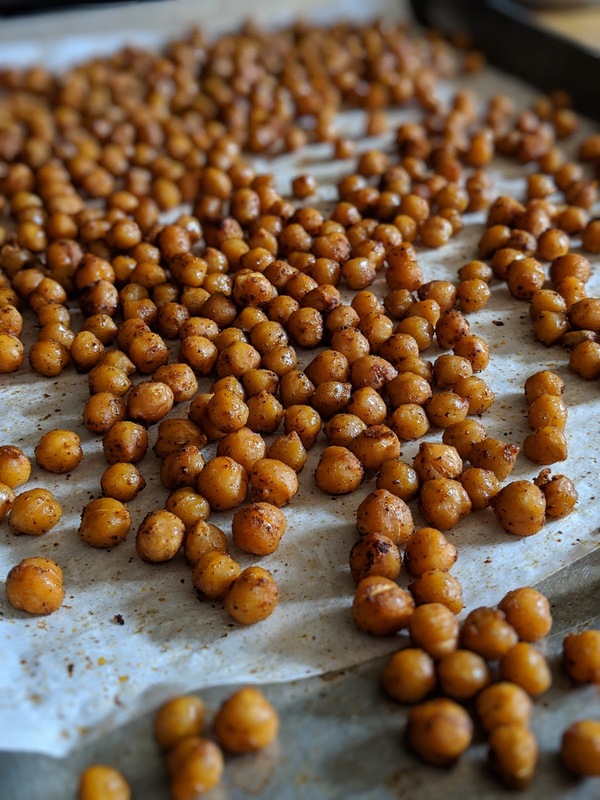 Chickpeas will crisp up more as they cool.